Available at Cowichan Auto Repair in Duncan, British Columbia. This is a BC car located in BC. It needs to be picked up in Duncan, BC. This is our own vehicle for sale. We do not sell other people's cars. Cowichan Auto Repair does vehicle repair and detailing. 2009 Black Mercedes R320 Turbo Diesel. Mint condition. 3 row, 7 passenger SUV/CUV. 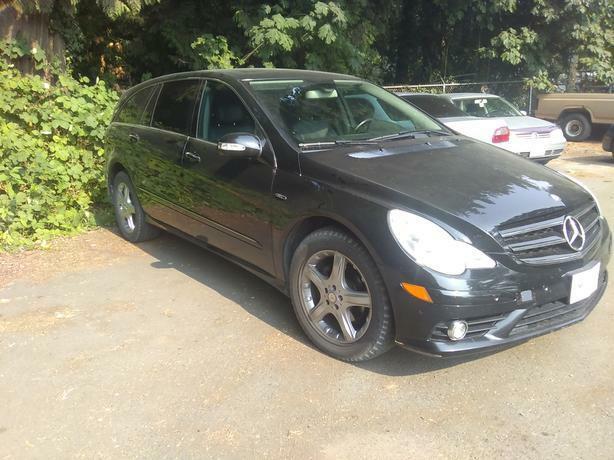 Leather interior, navigation system, and Mercedes 4matic AWD/4x4. This is the second generation with all the safety improvements over the first generation and less required maintenance than the later models. 213km, fully serviced with all new synthetic fluids and Mann OEM filters. Air suspension in the rear and a long wheelbase make this a very comfortable vehicle for the driver and passengers. This vehicle is ready to drive anywhere. This is our own vehicle. Welcome to Cowichan Auto Repair! We are open 8-4: 30 pm Monday to Saturday. We are located at 5275 Chaster Rd in Duncan, beside Kal Tire. We are a female owned and operated full-service auto shop offering full mechanical repairs from tune-ups to brakes and safety inspection as well as major repairs. Gain peace of mind with our services, we offer you a FREE warranty with any purchase over $50.00 and included in your warranty is roadside assistance for 365 days from the date of repair valid anywhere in North America. Coverage includes towing, unlocking, boosting, fuel delivery and flat tire repair. Our in-house detailing facility or mobile detailing services range from a mini detail to a premiere complete restoration. We can get your pet hair/odours out or put your car back into showing condition. Our oil changes start as low as $44.00 and include vehicle pick-up or drop-off or Drop in for a slow oil change (Yes, Slow!) Ask us why it's the only way to do it safely and get it right. Our mobile services make your life easier. We can detail or repair your vehicles off-site at your convenience. We offer complimentary engine scans as well as free estimates no appointment necessary. Loaner cars can be made available when needed. Visit our location at 5275 TCH / Chaster Road in Duncan beside Kal Tire.